The location of the ICC near highways A4 and A1 makes it easy to reach from many places within Poland and Europe. Numerous car parks in the vicinity allow convenient access to the facility. By taxi from Plac Oddziałów Młodzieży Powstańczej or ul. Młyńska. The bus and tram stops closest to the International Conference Centre are "Katowice Rondo", "Katowice Spodek", and "Katowice Uniwersytecka". The International Conference Centre is 30 km from the Katowice airport. 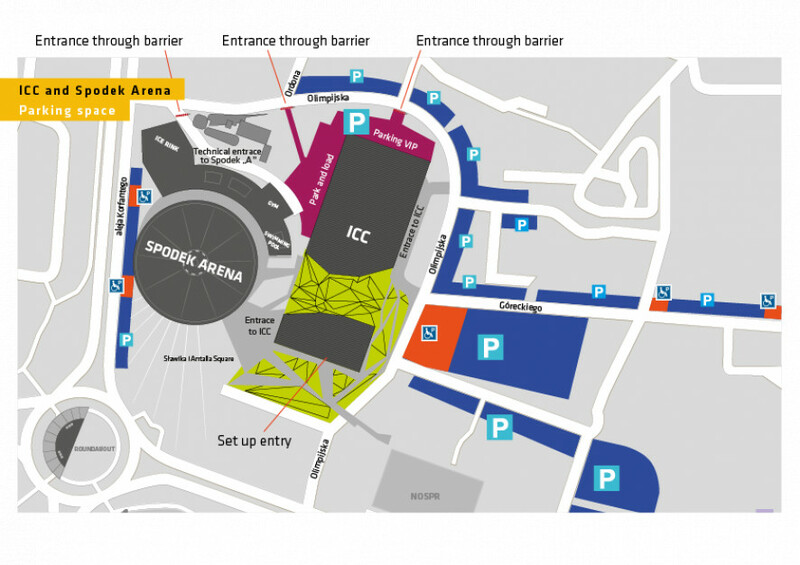 Travel from the airport to the ICC by car takes around half an hour. Taxis from the airport cost around PLN 100, and buses around PLN 30). When taking a bus from the Katowice airport, you can get off at stops Katowice Sokolska (1 km from the ICC), or Katowice Hotel Novotel (850 m from the ICC). The proximity of international airports in Kraków Balice (70 km, around 50 min.) and Ostrava (130 km, around 1.2h) make the ICC easy to reach from many destinations in Poland, Europe, and beyond.